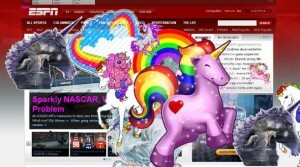 It is unknown when exactly the hack was added but on Monday 4/27 it was discovered that entering the Konami cheat code (up, up, down, down, left, right, left, right, B, A, enter) at the official ESPN Web site made glittery pink unicorns with rainbow manes and tails pop up all over the site. And more clicks led to more unicorns. In addition to this visitors also got their headlines in hot pink and the Comic Sans font (every designers fav font). The hack has since been removed but Cnet caught a screenshot of it before the takedown. wow, i thought “bad at sports” was just an ironic witticism. I had no idea Duncan had real jock issues. seek help my friend!